How true! How things and people change over a period of time and keep changing. If I think of myself years ago and now, I can barely recognize myself! As a kid, I would most of time be in my room, my nose buried in a book. Tinkle, Tintin, Enid Bylton, Nancy Drew, Hardy Boys, then came along Sidney Sheldon, Jeffery Archer, Mills and Boon... When we had guests over, my parents would have to call me to say hello to them, and then I would promptly disappear back into the room in a flash. Now I have changed, I love company. Am am obsessed with cook-books instead of novels. In school, I was the very serious student, pretty good at academics, lazy at sports. Teachers would ask us what we wanted to do when we grew up. Though I loved reading Biology and Chemistry, I hated the sight of blood and the smell of disinfectant, so I was not born to be a doctor. Math was not really my favorite subject, so not an engineer either. These two in those days were the most highly recommended and aimed at professions. What I loved was languages. What I really wanted to be was a home-maker...and that was it. But it was hardly the thing you would win applause for from the teacher or class when you said that. I got what was considered as pretty good percentage in my 10th exams. So taking up science as a subject in college was the thing to be done. But unambitious me opted for commerce. My father retired as a Professor in Chemistry, all of us siblings studied in the same college where he taught. My older sister was doing her Bachelors in Science, my younger sis knew from the time she was in Nursery (no kidding!) that she would be a doctor (she is a pathologist with a string of medical degrees now!) The Principal of the college (who also happened to be my mother's teacher in college) was not happy with my choice of academic & career route. I was called to his chamber, he wanted to know if I was really really sure that I did not want to be a doctor or an engineer. I mumbled my yes. You see, I was very unambitious. Now, I am extremely ambitious. In the sense, I want to try to bake everything possible:-). Though I won a couple of prizes in elocution competitions, I was not one to just talk to people a lot, unless necessary. Now I talk nineteen to the dozen. Gosh, look at how I have been blabbering endlessly of late here! Let me stop here today and share some simple Cottage Cheese, Cherry Tomato and Pasta Salad with you. Adapted from various recipes along similar lines. Procedure : Make sure your pasta is boiled al dente, well drained and refreshed in cold water. Add a few drops of oil and toss to ensure that the pasta doesn't stick to each other. Cut the cottage cheese into fingers and grill lightly on a greased griddle. Remember not to overdo this or the cheese will become tough. Remove from the griddle, cool and cut into cubes. Wash and dry the cherry tomatoes. Mix all the ingredients for the dressing in a bowl. 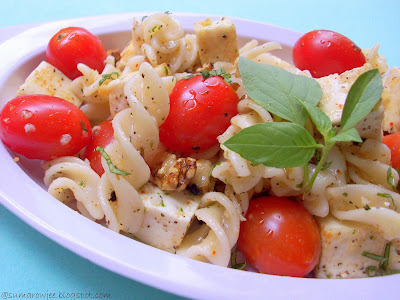 Add the pasta, grilled cottage cheese cubes, chopped walnuts and the cherry tomatoes. Toss to coat well with the dressing. 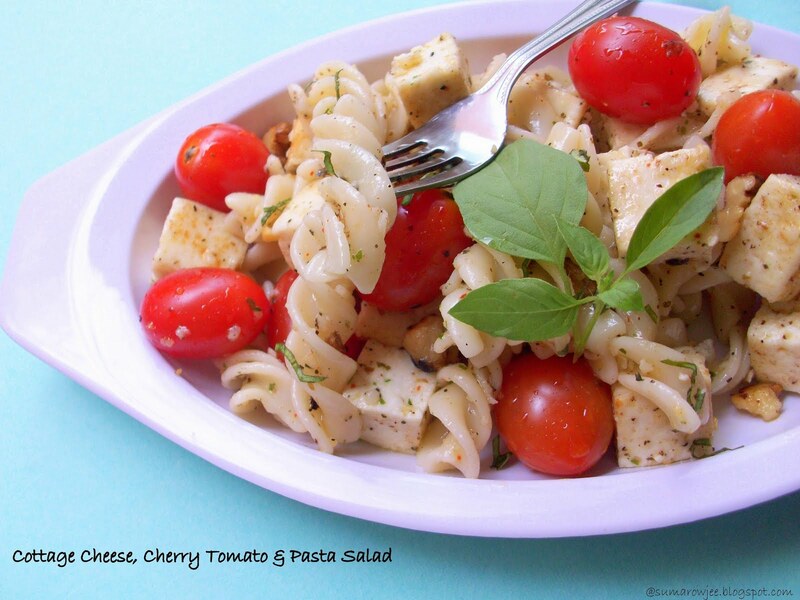 Garnish with fresh basil and serve immediately. Talking about change, am having a tough tough time with the changes in blogger. Putting up this post has been a real struggle. I hope this gets sorted out very soon. its kinda my story...but just the opposite. I used to be very friendly and talkative girl but now I dont know why am more reserved and silent. 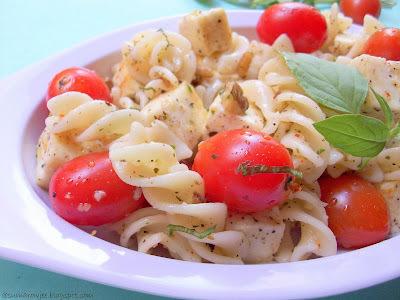 love this pasta salad. refreshing and summer-y. I was an avid fan of Jeffery Archer , Sidney too :-) In fact I used to read more of novels than my study books ! !